UPDATED: Tue., May 15, 2018, 10:54 p.m.
PULLMAN – For 12 innings, the Washington State Cougars were able to extinguish just about every one of Gonzaga’s rallies. But even in doing so, it felt like a matter of time before some executional mishap, a slew of missed opportunities on offense or both would eventually cost the home team at Bailey-Brayton Field. The Cougars have been defeated 28 times on a baseball diamond this season. Tuesday night’s 3-2 loss to the Bulldogs was a heart-wrencher for the ages. WSU (15-28-1) ultimately fell to Gonzaga (27-21) – and conceded the season series – because Michael Newstrom plunked the leadoff hitter in the top of the 13th inning, then watched Jack Machtolf take second on a sacrifice bunt, advanced him to third on a wild pitch and subsequently sent him home on a balk. Enough errors in a single frame to make a coach’s stomach churn. But Lees’ qualms with WSU’s performance on Tuesday weren’t reserved exclusively for Newstrom, or the disastrous 13th inning. The Cougars left 16 runners on base – not as many as the 18 stranded by Gonzaga – and they were 0 for 11 with men in scoring position. Their 11 hits only produced only two runs and WSU went the final nine innings without crossing the plate. After seven innings, it appeared the Cougars might be cruising to a 2-0 victory – and a series win – over their opponents from the West Coast Conference. James Rudkin put WSU on the board in the fourth inning when he yanked a pitch clear over the wall and trees in left field. The Cougars doubled their tally when Cal Waterman scored Danny Sinatro on a sacrifice fly, after Ryan Ramsower pushed Sinatro to third with a fly. 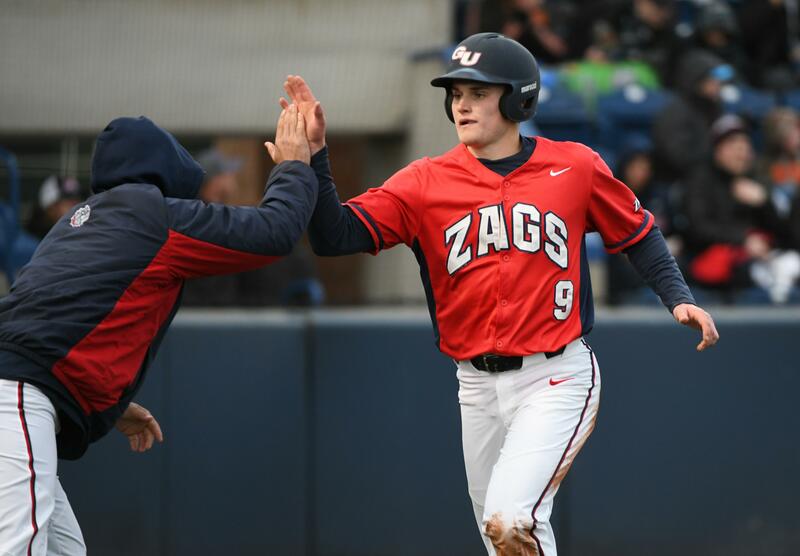 They were six outs shy of a shutout victory when Gonzaga made its charge. A leadoff walk in the top of the eighth put Austin Pinorini on first. He got to third on a wild pitch and Nick Brooks singled him in with a hard-hit ball through the right side of the infield. Jake Vieth, with one of his three hits, singled in the Zags’ second run a few batters later. Vieth, Pinorini and Ernie Yake all had three-hit games for Gonzaga, which shelled out 16 hits as a team. Ramsower was WSU’s best offensive weapon in the game, collecting three hits before Lees made a defensive-minded switch, replacing him with Mason De La Cruz in the top of the seventh. Tuesday’s game was the longest – in innings – for WSU since a home game against Utah in 2014 also lasted 13. Published: May 15, 2018, 10:36 p.m. Updated: May 15, 2018, 10:54 p.m.